The Trade Unionist and Socialist Coalition (TUSC) was set up with the initial aim of enabling trade unionists, community campaigners and socialists to resist electorally the pro-austerity consensus of the establishment parties in the 2010 general election. After that election, however, a conference was held of candidates and campaign organisers which agreed to continue with TUSC for future electoral campaigns. The position that was outlined in the TUSC founding policy statement prepared for the 2010 election remains. "The working class and peoples of Britain are facing a ruling class offensive against public services, incomes, living standards and trade union rights", we wrote, and it is "an offensive which has support across all the establishment parties". The constant mantra of Labour spokespeople since then, not of clear opposition to the austerity agenda but merely that it goes 'too far and too fast', only confirms this. That was why, our founding statement went on, "the Trade Unionist and Socialist Coalition will contest elections, to show that there is a clear left-wing alternative to policies of public sector cuts, privatisation, militarism and environmental degradation". TUSC recognised, and still does, that there can be "Labour and non-Labour candidates who agree with our policies, who share our socialist aspirations, and who will be supported by left and labour movement organisations participating in our coalition". It was also recognised in the founding statement "that there are different strategic views about the way forward for the left in Britain, whether the Labour Party can be reclaimed by the labour movement, or whether a new workers' party needs to be established". But TUSC was and remains "united on the need for mass resistance to the ruling class offensive, and for an alternative programme of left-wing policies to help inspire and direct such resistance". The arguments which motivated the formation of our coalition still need to be expressed. In the age of austerity, workers still lack a political voice. (i) The Trade Unionist and Socialist Coalition should remain registered with the Electoral Commission and maintain and develop a structure that enables it to fulfil its core task. This still is, essentially, to provide an opportunity for local groups of trade unionists, community campaigners and socialist organisations who want to stand candidates in elections to appear on the ballot paper, if they so wish, as part of a wider challenge - as TUSC candidates rather than as 'Independents'. (ii) To this end, TUSC will endeavour to co-ordinate challenges in local and parliamentary elections. We will organise conferences open to local TUSC steering committees or branches, delegates from trade union branches, political organisations and independents supportive of TUSC, and other local groups who are planning to stand candidates in such elections, and will back any efforts by TUSC supporters in Scotland to organise similar events to prepare for elections there. (iii) TUSC will also consider, on a case-by-case basis, endorsing candidates to stand under its banner at parliamentary and local council by-elections. 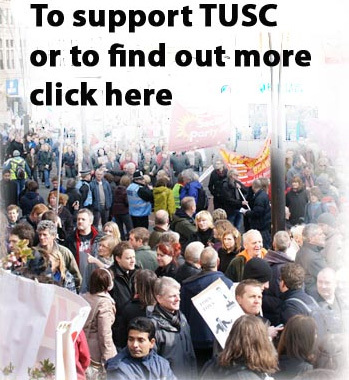 (iv) The founding TUSC statement developed for the 2010 general election remains in place, with subsequent updating revisions, as a summary of TUSC's core policies. In addition supplementary policy statements shall be developed for local elections and other future election campaigns, to be discussed at the relevant conferences. (v) We also confirm that, as a federal 'umbrella' organisation, participating organisations will continue to be able to produce their own supporting material, subject to electoral law, as has been the practise successfully adopted in our election campaigns to date, which allow different organisations and local campaigns to collaborate under a common banner. (i) TUSC shall continue to have a Steering Committee, comprised of representatives of the RMT, the Socialist Party, the Socialist Workers Party, and the TUSC Independent Socialist Network, plus in a personal capacity, Steve Gillan, Chris Baugh, Joe Simpson, John McInally, Ian Leahair, Brian Caton, Nina Franklin, Michael Lavalette and Nick Wrack. The steering committee will operate by consensus. (ii) The adherence of further organisations will be subject to the approval of the steering committee. The steering committee can also agree to expand its membership to other leading trade unionists as it decides. (iii) TUSC supporters in Scotland shall continue to organise autonomously, with their own Scottish TUSC Steering Committee. (iv) Local TUSC steering committees or branches will be established, where possible, for local government areas and parliamentary constituencies where it is planned to contest seats on whatever broadly similar basis is appropriate for each. (v) The participants in TUSC recognise that this structure remains only an interim arrangement and that discussions must continue to take place on the best way to organise the coalition as it develops in the future. Future conferences of TUSC shall make provisions to include debates on this issue. (i) Candidates from organisations participating in the Steering Committee and the Scottish TUSC Steering Committee can expect to have their nomination papers for elections authorised by the coalition nominating officer as TUSC candidates if they so request. They can also stand, if they wish, under the existing registered electoral name of their organisation. (ii) Other prospective candidates, from local trade union organisations or other organisations, can also request to stand as TUSC candidates. All such requests shall be referred to the Steering Committee for decision. (iii) Prospective candidates will be asked to endorse the coalition's founding core policy statement - and the relevant supplementary policy statement for the election they are contesting - but, with that provision, candidates will be responsible for their own campaign. (iv) The Steering Committee will have the final say on all coalition seats and candidates. (v) The Steering Committee will seek to raise funds for national campaigning. For local challenges, the normal expectation will be that local deposits and campaigns will be financed locally. Bob Crow, RMT General Secretary, and Peter Pinkney, RMT National President, and Daren Ireland, Sean Hoyle, Steven Skelly, Darren Procter and Sean McGowan, RMT National Executive, representing the RMT; representatives from the Socialist Party, the SWP and the TUSC Independent Socialist Network; plus, in a personal capacity, Steve Gillan, POA General Secretary; Chris Baugh, PCS Assistant General Secretary; Joe Simpson, POA Assistant General Secretary; John McInally, PCS Vice-President; Ian Leahair, FBU National Executive; Nina Franklin, ex-NUT President; Brian Caton, ex-POA General Secretary; Cllr Michael Lavalette; Cllr Keith Morrell; Cllr Don Thomas; Nick Wrack.